The art cover published on our site yesterday wasn't the correct one. The new one above may still be a mock up cover for this project as they might decide later on for something different. 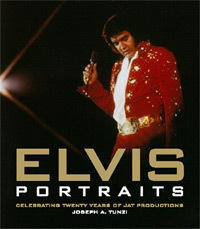 As mentioned yesterday, "Elvis - Portraits" celebrates twenty years of JAT Productions with this special project which is due for release in the first quarter of 2008.